Wristbands available each day for $20. $2 discount available Tuesday, Wednesday, Thursday if you bring 2 cans per wristband you wish to receive discount. Individual ride tickets sold each day and valid all week. 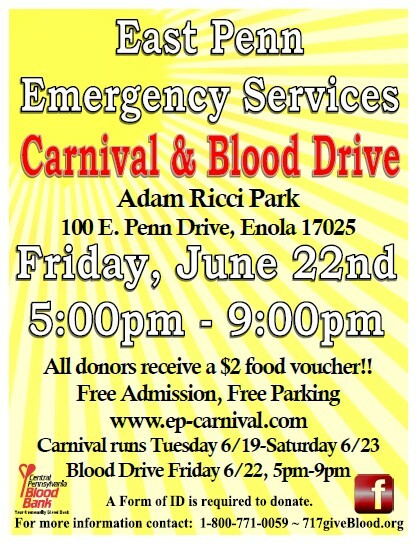 Blood Drive on Friday June 22. Firework Display is Saturday June 23. If weather forecast calls for rain Saturday then, fireworks will be displayed on Friday June 22. Live music each evening starting at 7pm. Kids Night occurs on Tuesday June 19- free balloon animals, face painting, Turkey Hill ice cream and drink samples. 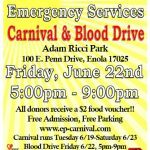 Alpacas present at the carnival on June 20 and June 21.